Fig. 1—Curve for traditional steels showing the n-value for each MPa-yield-stress steel. Last month this column emphasized that our traditional steels have work-hardening exponents (n-values) that remain constant during deformation. These n-values are proportional to the yield strength of the steel (Fig. 1). The users of these steels provide a good base of information for product and tool designing. This constancy of properties is the result of the constancy of the steel composition. These traditional steels have a ferrite microstructure as their base, and most coils are created with this ferritic material. Some minor changes can be made at the atomic level (such as switching atoms) to make minor strength changes. Around 1977, metallurgical re-searchers began asking questions such as “Why are we only using ferrite when making our steels? 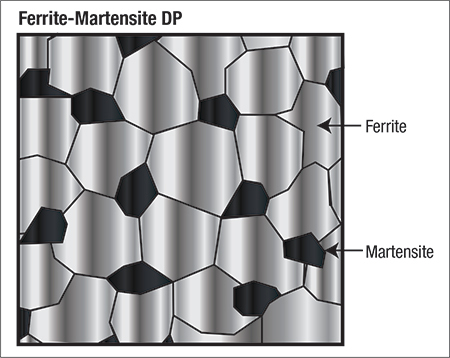 There are other phases or material that could be added to ferrite.” The first attempt was to add about 10-percent martensite to the microstructure (Fig. 2). When deformation began, ferrite and martensite interacted, which produced an increase in the n-value at that steel location. The new steel was named dual-phase (DP), defining the two-phase metals. The increase in n-value was very useful in restricting the onset of a narrow deformation gradient (Fig. 3). 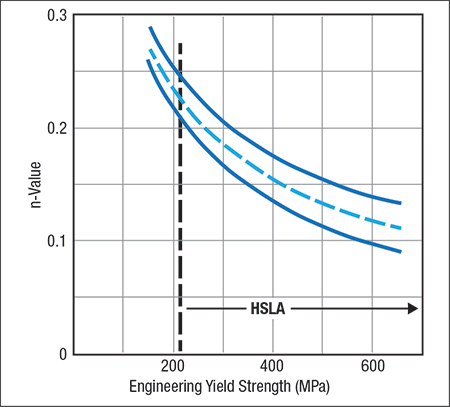 Note the peak n-value of 0.20 compared to 0.13 for the high-strength, low-alloy (HSLA) steel. Unfortunately, the higher n-value was active only across the 2- to 8-percent engineering-strain range. Researchers then decided to create a more complex steel by adding other phases that would trigger the growth of more martensite sites and higher n-values, thus transformation-induced plasticity (TRIP) steel was born. Fig. 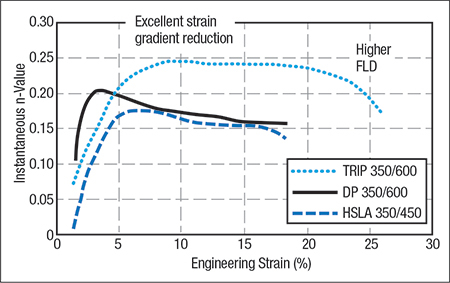 3 shows the very high n-value of 0.25 over a strain range of 0.10- to 20-percent engineering strain. The 0.25 n-value is comparable to vacuum-degassed interstitial-free steels at a yield stress of less than 25 ksi. HSLA, DP and TRIP steels are shown in Fig. 3 for high yield strengths of 50 ksi. Additional data have shown the same performance at much higher yield strengths.